Nothing quite says "1980s" like this photo. A name from the dim past of the 1980s has resurfaced. Selected by the late George Steinbrenner to dig up dirt on his high-paid star, Dave Winfield, Spira now bares all in an interview with New York radio station WINS. The phone-conversation tapes, while not of Watergate proportions, do reveal a different George Steinbrenner from the one Yankees players such as Derek Jeter and Jorge Posada came to know. In his salad days (an expression from Shakespeare’s Antony and Cleopatra), Mr. Steinbrenner could be vicious. This is not to say that his under-performing superstar, Winfield, was perfect. 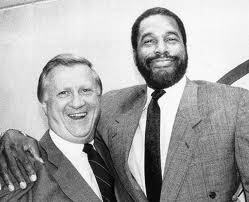 But Winfield would eventually be elected to the National Baseball Hall of Fame, an honor that has thus far eluded Steinbrenner. (The writers have long memories.) Incidentally, most baseball fans remember, speaking of long memories, that Dave Winfield was born the very day Bobby Thomson hit The Shot Run Heard Round the World. This entry was posted in Baseball, Yankees and tagged Bobby Thomson, Dave Winfield, Derek Jeter, George Steinbrenner, Howard Spira, Jorge Posada, Literature, National Baseball Hall of Fame, New York Yankees. Bookmark the permalink.